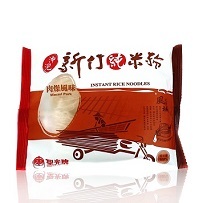 The product is pre-cooked and steamed, no soaking or boiling required before cooking. 1. Rinse the noodles for 10 seconds, and drain the water away. 2. Fry together by Mixing a spoonful of edible oil with shrimps, mushrooms, red carrots. Then add some salt, a bit MSG, and soy sauce for seasoning. 4. Cover with the lid for 2 min, and it is ready to serve.